Anybody between the age of 18 and 25 who is not married and has not children of her own. 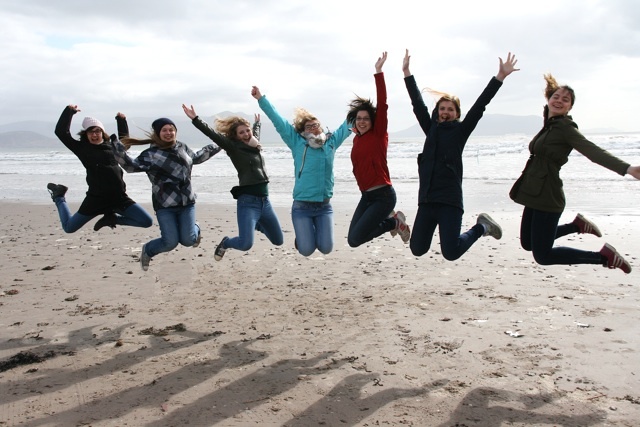 Most Au pairs come to Ireland straight after Secondary School or, alternatively, take a year off while at university or after finishing their job training. Ninety-nine percent of all Au pairs are female. For a young man it is much more difficult to find a placement with a host family as an Au pair. What insurance cover will I need as an Au pair in Ireland? It is strongly recommended that all applicants taking up Au pair positions in Ireland take out their own health insurance. A good insurance company for German Au pairs is Hanse-Merkur (Email Hanse-Merkur). Without private insurance you would have to pay, in the event of illness, for any visit to the doctor/hospital. (In an emergency, however, urgent health care would be covered by the state just as in the case of Irish citizens.) No other insurances are required. Will my driver’s licence be valid? Will I be able to drive a car in Ireland? It's unlikely that you'll be driving in Ireland unless you – or your family – is willing to pay a high insurance premium. Car insurance in Ireland is taken out for the driver – not for the vehicle as is the case in Germany. Car insurance in Ireland is much more expensive than in Germany, particularly if you are under 25 (as the majority of the Au pairs are). Your own driver's licence is, in fact, valid in Ireland, but, to drive here, the host family would have to take out special insurance for you – which not many families are prepared to do because of the high cost involved. Driving a car without insurance in Ireland is a crime punishable by severe penalties! Will I be able to attend language classes as an Au pair? Of course. The family is required to give you enough time off to be able to do courses for the duration of your stay as an Au pair – at least one regular evening per week. How many hours a week will I be on Au pair duty? The weekly hours you have to help the family must be agreed between you and your host family. As an Au pair, you agree with your host family to help in the house for 25 to 35 hours per week, and your duties will be primarily childcare-related duties including some light house-work. What you do, how frequently, and for how long, depends to a large extent on individual family requirements and will be discussed and agreed upon by you, the Au pair, and your host family. The agreement between the Au pair and the host family stipulates that Sunday and one other day during the week are free. How will I get to Ireland/to my host family? 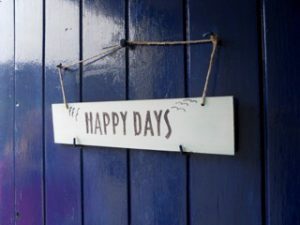 In most cases the Au pair books her own flight from her home country to Ireland, choosing the nearest destination Airport to the family’s home. Remember that being an Au pair is not the same as having a salaried job. Rather, it is an opportunity to spend time in another country as part of a cultural exchange. It will provide you with an opportunity of becoming fluent in English and sharing family life with people who will become lifelong friends. As part of that family, you will play the role of a responsible "older sister". Consequently, the payment you receive will be like substantial pocket money, rather than a salary. Our host families are required to pay their Au pair a minimum pocket money of €100 – €120 per week. How much pocket money a host family pays and what other additional perks they would give their Au pair can vary widely. Some Au pairs come to individual arrangements with their host families, occasionally receiving extra payment for extra hours worked (if, for example, both parents must work late) or whatever. Some host families pay for the gym membership of their Au pair, others take out car insurance for their Au pair, or give them credit for their Irish mobile phone. What kind of duties will I be expected to do? This question is a difficult one to answer. No two households operate in the same way. One Au pair might, for example, be in charge of an eight-year-old boy when he returns from school, give him his lunch and supervise him doing his homework. Another Au pair might have to drive two children to playschool in the morning, and look after a third child of 9 after school. Some Au pairs do vacuuming, ironing and cooking. Others might do less. Still other Au pairs might occasionally change nappies for babies and help put them to bed in the early evening. All of the duties mentioned here would fall under the category of light housework around the home. But remember, it is up to you to discuss your duties with your host parents. You should expect to help out a reasonable amount of hours per week. On the other hand, though, if you feel that what you are expected to do is unreasonable, you must discuss it with your host family before things turn sour. The best strategy is to be honest and to say what is on your mind if something is bothering you. 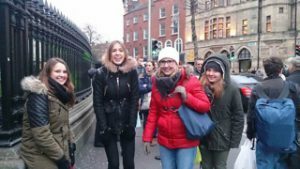 What have other Au pairs said about their stay in Ireland? For sure, the one year I spent in Ireland as an Au pair was the best of my life! I made so many friends and I'm still in frequent contact with most of them. The agency, Au pair Service Europe, was always there and looked after us very well. We could always turn to Joachim without hesitation if we needed him. We had some great trips which allowed us to really get to know Ireland. The weekly get-togethers gave us the opportunity to meet up and discuss our daily experiences. They were always a great laugh! But being an Au pair is so much more than just having fun - you learn so much about your own personality, your attitude to life and the values you hold dear. I got to know very much about the Irish mentality and way of life this year and I absolutely loved it! During my stay in Ireland my host family became my family and our lives were a mutual giving and taking. We treated each other with tolerance, respect and, above all, love. I know that we will stay friends for a lifetime!